Hi it's Cheryl from Primary Graffiti. I'm back today to share a file spring themed activities! Up first, Core Centers! Link in first graphic! Are you a little curious about my core themed centers? I created a freebie sample themed for March Madness! Link in first graphic! I finished up my current Swallowed Tub. This one aligns with There Was An Old Lady Who Swallowed a Chick. Eek! This one is my favorite and so late. I discounted it several dollars for a short time! Link in first graphic! 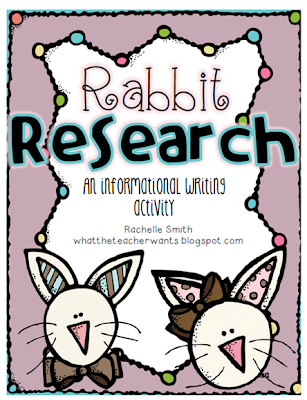 Have you seen Rachelle's cute new Rabbit Research Unit? Ahhhh! So cute! I'd prepared bunny books for the kids when we return from break and planned on creating something to record our research. In a timely fashion, Rachelle from What a Teacher Wants created and posted a much needed file. I scooped it up immediately. Check it out by click the graphic below! 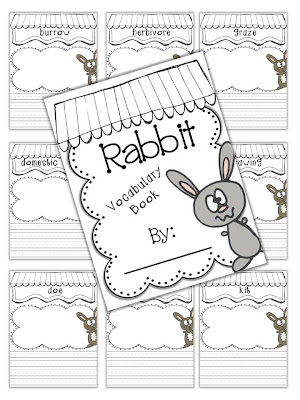 After speaking with Rachelle, I uploaded a vocabulary book to align with her unit. I'm eager to come back and share the results of our learning!!! To see more previews of Rachelle's unit, link here. That's All Folks! I'd be honored if you stopped by Primary Graffiti to say Hi!